This video features the Power of Pain Foundaton’s Faces of Pain Video 5. 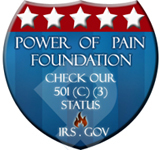 The Power of Pain Foundation (POPF) is a 501 (C)(3) Non Profit Charity. There have been over 10 million patients diagnosed with Reflex Sympathetic Dystrophy, Complex Regional Pain Syndrome and Causalgia in the United States alone. These are just a few of the sufferer’s and survivor’s who struggle with this most painful, debilitating and often progressive neuological, neuropathic and auto immune disease. There is still no cure to date!